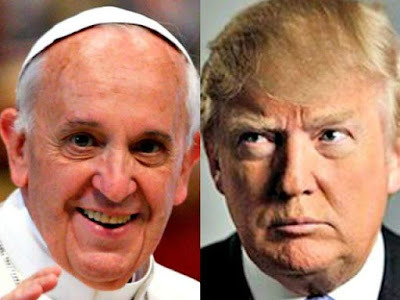 Apparently the Pope does not think Donald Trump is a Christian. “A person who thinks only about building walls, wherever they may be, and not building bridges, is not Christian,” Francis said when a reporter asked him about Mr. Trump on the papal airliner as he returned to Rome after his six-day visit to Mexico. I would have to agree with the Pope that Mr. Trump does not show much evidence of being a Christian – but not for the reason he states. While I disagree with Mr. Trump’s policy on immigration, and wonder what his policies are in regard to anything he supposedly supports, political opinions do not make a person a Christian, nor do they guarantee someone is not a Christian. As I have said before in this blog – your political opinions will not save you. Be that as it may, I think the Pope misunderstands the requirements for being a Christian. Sinner : The first requirement for being a Christian is to be a sinner. This is the easiest qualification to meet as we are all conceived in sin. Sinning comes naturally to us. Needy: Not needy as requiring more food, money, or attention. Christians must understand their need for a Savior. If we do not recognize our sin, we do not see a need for a Savior. We instead begin to think we can save ourselves by living a good life. It is not that God waits for us to recognize our need. It is that the lack of this need turns us away from God. Faith: Christians need faith. Not a faith of our own making, but faith found in the Word and Sacraments. We need a faith given and nurtured by the Spirit. An additional aspect to being needy is that we cannot even manufacture our own belief. Redemption: Because the only thing we don’t need is sin, we do need someone to live a perfect life and take our sin upon Himself. We need the Son of God to die and rise again on our behalf. "I like to be good. I don't like to have to ask for forgiveness. And I am good. I don't do a lot of things that are bad. I try to do nothing that is bad." Did you see what he did there? He sidesteps the question about asking for forgiveness by assuring his followers that he tries to do nothing bad. Hmm. Given the sheer meanness of the campaign, this is probably the nicest thing that Trump has said to date. Perhaps the Pope approves of this statement, I don't know. However, this statement is not Christian because it is not needy. It is spoken by a man who thinks he can save himself in the same way he has remade his fortune after each bankruptcy. Christianity is not about the art of the deal. It is about the perfect love. It is about supreme sacrifice. It is about life-giving faith. But, it is for us.